Recently, a new study published in Cell Stem Cell showed that induced pluripotent stem (iPS) cells may play as an anti-cancer vaccine. The study has shown that injection of treated iPS cells into mice can protect mice from breast, lung and skin cancer, and prevent the regeneration of tumors after resection. Although utilizing unrelated cells to trigger cancer immunity may not be intuitive, this idea is very common in the research. For example, cancer cells and embryonic cells share similar gene expression and antigenic characteristics. Earlier studies showed that injecting embryonic material into animals can protect them from transplanted tumors. Stem cells as a cancer vaccine, this is not a completely new concept, but it has not been discussed extensively yet. The new study has transformed “Stem Cell Cancer Vaccine” into a very credible and exciting scientific concept. Early studies that take embryonic stem cells as vaccines which involve ethical issues and feasibility limitations. These cells are genetically different from the patient and may not be able to provide a matching cancer antigen. However, this new study uses iPS cells that circumvent the above problems. The ultimate goal of the researcher is to separate blood or skin cells from the patient’s body and create iPS cells, the cells induced by irradiation can not form tumors themselves, and then being transfused back into cancer patients. 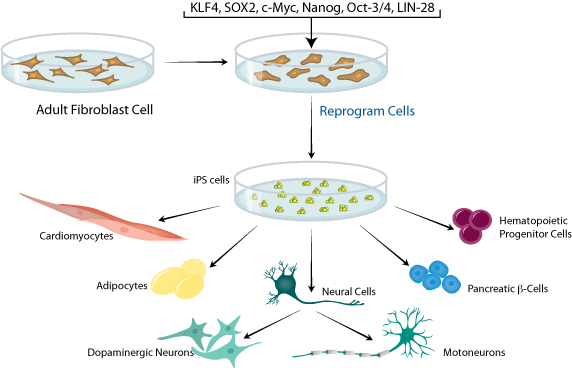 In order to explore the feasibility of these concepts, the researchers, starting from mouse experiments, determined that mouse and human induced pluripotent stem cells have similar gene expression profiles to cancer cells for the first time. The team combined the iPS cells derived from mouse fibroblasts with CpG, an immune-enhancing molecule, to vaccinate experimental mice. A few weeks later, breast, skin or lung cancer cells were injected into the test mice. As a result, it was found that the control group formed a considerable tumor after several weeks of injection of the cancer cells, but the mice receiving the stem cell vaccine tended to have smaller tumors or degenerated tumors, which means that the vaccine worked preventively. In order to confirm the specific anticancer immunity conferred by the vaccine, the team transferred T cells from the vaccinated animals to unvaccinated breast cancer animals and found that the breast tumors began to regress. In addition, the study also showed that although the vaccine can not eliminate the skin cancer that has developed on mice, it can prevent the surgical resection of the tumor. Willem Overwijk, oncologist and immunologist at the MD Anderson Cancer Center at the University of Texas also recognize this study. He said that tumor resection usually can not eliminate all the cancer cells, and subsequent inoculation of iPSC vaccine can increase the anti-cancer response of patients which will be valuable. Taking patient’s own cells as a vaccine may induce autoimmune risk, however, there are not any increased inflammatory signals found in this study, either self-reactive antibodies found. In contrast, vaccinated mice grew healthily over time. At present, whether this vaccine will have similar efficacy and safety in humans remains to be determined. Animal testing provides a solid scientific basis and further research is still needed to explore the clinical potential of such vaccines.